Designed with the professional in mind, the DJI Inspire 2 Battery Carrying Case from CasePro provides you with a safe and convenient method of transporting multiple battery packs for your drone. 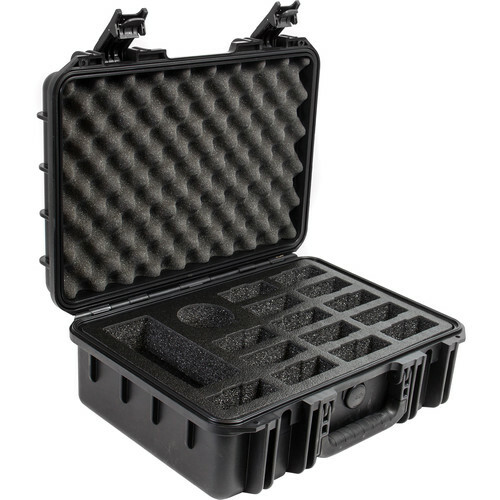 This hard-shell case has custom high-density foam slots to accommodate up to 14 DJI Inspire 2 battery packs, as well as a charging hub and charger. The rugged construction of this case features stainless steel hinges and dual trigger release latches, which help to secure the batteries from the elements. When closed and secured, the case is air-tight, waterproof, and dustproof. For added security, you can use up to two padlocks (not included) to lock the case. Box Dimensions (LxWxH) 18.4 x 14.6 x 7.5"
DJI Inspire 2 Battery Carrying Case is rated 5.0 out of 5 by 1. Rated 5 out of 5 by Craig C. from Perfect case and meets needs Perfect case and meets needs for plane travel. Is it fireproof? How much it weight loaded with a full set of batteries? Is it compliant with handbag luggage rules for civil aviation ? It is not fireproof. Check with the individual for their carry-on or checked baggage rules. Also check withe TSA.The batteries weigh in at 515 g (18.2 oz).Case details: This case is air tight, waterproof, dustproof and made in the USA. The CasePro DJI Inspire 2 Hard Case fits up to 14 batteries, battery charging hub, and battery charger. This case is the best solution for every Inspire 2 pilot, allows for more flight time, travel and storing away your Lipo batteries. FAA regulations now require carrying on Lipo batteries. Part No.CP-DJI-INSPIRE-2-BTProduct NameCasePro DJI Inspire 2 Battery Carry CaseInterior Length16.88Interior Width11.19Interior Height6.00Removable LidNoLid Height1.75Base Height4.25Exterior Length18.25Exterior Width13.79Exterior Height6.81MaterialHigh Density PolypropyleneHigh Density Polyethylene FoamInsane FoamManufacturing ProcessInjection MoldedInteriorDJI Inspire 2 battery insertColorBlackWater ResistanceWaterproofHingesStainless steel pin hingeLatchesTrigger release latches (2)Security Options2 padlock provisionsAta RatedYesWeight10.00 lbs.